When dealing with whiplash in Inverness FL we have some news for you that may make you feel a little better, Whiplash is treatable and there is hope, with treatment, you can heal and not have to deal with this pain for the rest of your life! 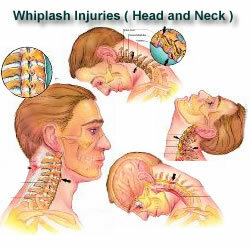 Whiplash treatments depend on the severity of the accident and the injury. Generally, the injury results in discomfort within a day or two (at times much longer even) after the accident however, some individuals may not notice the signs of a problem until several days or even a week after the accident. In most cases, whiplash symptoms develop within 24 to 48 hours after an accident. The severity of your symptoms and the amount of pain you experience may vary based on the accident and injuries you sustain. How Does Moss Chiropractic Treat Auto Accident and Whiplash Injury? At Moss Chiropractic of Inverness, we know how to treat victims of auto accidents and whiplash. Our multidisciplinary approach incorporates state-of-the-art medical technology using Motion Study Xray, Non-Surgical Spinal Decompression Therapy, the finest healthcare expertise and comprehensive plan of action to return you to your pain-free, happy, healthy, active lifestyle. At our Inverness Chiropractic office, our chiropractor specialize in treating whiplash and the bone nerve, and soft tissue disorders that cause pain due to your auto accident. Our Inverness team are experts in rehabilitation and will help you learn how you can help yourself recover from an auto accident injury. Whatever the root cause of your neck or back pain, the professionals at Moss Chiropractic Clinic of Inverness will get you properly diagnosed and treat you using cutting-edge technology and the finest medical attention. If you are experiencing whiplash, neck pain, back pain or any type of pain due to an auto accident, please contact us today, to help relieve your pain and correct its whats causing it.